While this controller was certified and is in our Hardware Compatibility List, its use means that your VSAN cluster was unable to cope with both a rebuild activity and running production workloads. While VSAN will throttle back rebuild activity if needed, it will insist on minimum progress, as the user is exposed to the possibility of another error while unprotected. This minimum rebuild rate saturated the majority of resources in your IO controller. Once the IO controller was saturated, VSAN first throttled the rebuild, and — when that was not successful — began to throttle production workloads. Another interesting observation while reading the thread on Reddit is that the Dell PERC H310 actually is an OEM version of the LSI 2008 card. John Nicholson wrote a very interesting blog about the H310 here. Dell seems to use H310 with old firmware. When using the latest firmware the queue depth of the Dell PERC H310 can be increased to 600! This article explains how to flash a Dell PERC H310 with newer firmware. I am not sure if a flashed PERC H310 is supported by VMware. As a HBA with better specs is not that expensive I advise to only flash Dell PERC H310 when used in non-production environments. An interesting post appeared on Reddit. The post titled My VSAN nightmare describes a serious issue in a VSAN cluster. When one of the three storage nodes failed displaying a purple screen, initially all seemed fine. VMware HA kicked in and restarted VM’s on the surviving nodes (two compute and two storage nodes). The customer was worried about redundancy as storage was located on just two nodes now. So SSD and HDD storage was added to one of the compute nodes. This node did not have local storage before. However exactly 60 minutes after adding new storage, DRS started to move VM’s to other hosts, lots of IO were seen, all (about 77) VM’s became unresponsive and all died. VSAN Observer showed that IO latency had jumped to 15-30 seconds (up from just a few miliseconds on a normal day). VMware support could not solve the situation and basically said to the customer: “wait till this I/O storm is over”. About 7 hours later the critical VM’s were running again. No data was lost. At the moment VMware support is analyzing what went wrong to be able to make a Root Cause Analysis. Issues on VSAN like the one documented on Reddit are very rare. This post will provide some looks under the cover of VSAN. Hope this helps to understand what is going on under the hood of VSAN and it might prevented this situation happening to you as well. Lets have a closer look at the VSAN hardware configuration of the customer who wrote his experiences on Reddit. The customer was using 5 nodes in a VSAN cluster: 2x compute nodes (no local storage ) and 3x storage nodes, each with 6x magnetic disks and 2x SSD’s, split into two disk groups each. Two 10 Gb nics where used for VSAN traffic. A Dell PERC H310 controller was used which has a queue depth of only 25. Western Digital WD2000FYYZ HDDs were used with a capacity of 2 TB, 7200 rpm SATA drives. SSD’s are Intel DC S3700 200 GB. Our entry-level controller card provides moderate performance. Before we dive into the possible cause of this issue lets first provide some basics on VMware VSAN. 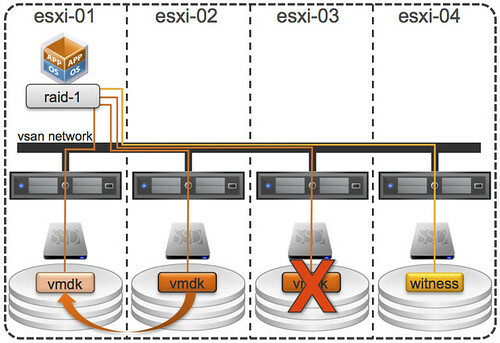 Both Duncan Epping and Cormac Hogan of VMware wrote some great posting about VSAN. Recommended reads! See the links at the end of this post. use one of the VSAN Ready Nodes which can be purchased. 16 models are available now from various vendors like Dell and Supermicro. Dell has 8 different servers listed as VSAN Ready Node. One of them is the PowerEdge R720-XD which is the same server type used by the customer describing his VSAN nightmare. However the Dell VSAN Ready Node has 1 TB NL-SAS HDD while the Reddit case used 2 TB SATA drives. So likely he was using servers assembled himself. Interesting is that 4 out of the 8 Dell VSAN Ready Node server use the Dell PERC H310 controller. Again, VMware advises a controller with a queue depth of over 250 while the PERC H310 has 25. For each virtual machine or virtual disk active in a VSAN cluster an administrator can set ‘virtual machine storage policies’. One of the available storage policies is named ‘number of failures to tolerate’. When set to 1, virtual machines to which this policy is set will survive a failure of a single disk controller, host or nic. VSAN provides this redundancy by creating one or more replica’s of VMDK files and stores these at different storage nodes in a VSAN cluster. In case a replica is lost, VSAN will initiate a rebuild. A rebuild will recreate a replica of VMDKs. VSAN response to a failure. VSAN’s response to a failure depends on the type of failure. A failure of SSD, HDD or the diskcontroller results in an immediately rebuild. VSAN understand this is a permanent failure which is not caused by for example planned maintenance. A failure of the network or host results in a rebuild which is initiated after a delay of 60 minutes. This is the default wait. The wait is because the absense of a host or network could be temporary (maintenance for example) and prevents wasting resources. Duncan Epping explains details in this post How VSAN handles a disk or host failure . The image below was taken from this blog. If the failed component returns within 60 minutes only a data sync will take place. Here only the data changed during the absence will be copied over to the replica(s). A rebuild however means that a new replica will be created for all VMDK files being not compliant. This is also referred to as a ‘full data migration’. For monitoring VSAN Observer provides insight on what is happening. The VMware VSAN Quick Troubleshooting and Monitoring Reference Guide has many details as well. It looks like the VSAN rebuild process which started exactly 60 minutes after having added extra storage initiated the I/O storm. VSAN was correcting an incompliant storage profile and started to recreate replica’s of VMDK objects. VSAN seems to use a Quality of Service system for throttling back replication traffic. How this exacty works and if this is controlable by customers is unclear. I am sure we will soon learn more about this as this seems key in solving future issues with low-end controllers and HDDs combined with a limited number of storage nodes. 1. Only three servers in the VSAN cluster were used for storage. When 1 failed only two were left. Those two both were active in rebuild for about 77 virtual machines at the same time. 2. Using SATA 7200 rpm drives as the HDD persistent storage layer. Fine for normal operations when SSD is used for cache. In a rebuild operation not the most powerfull drives having low queue depths. 3. Using an entry level Dell PERC H310 disk controller. The queue depth of this controller is only 25 while advised is to use a controller with 250+ queue depth. 2. for production workloads use N+2 redundancy. 3. use NL-SAS drives or better hdd. These have much higher queue depths (256) compared to SATA hdd (32). 4. in case of a failure of a VSAN storage node: try to fix the server by swapping memory/components to prevent rebuilds. A sync is always better than a rebuild. in case n+2: all rebuilds only during non-business hours. Tier 1 vm’s first, then tier 2 then tier 3 etc. Duncan Epping and others wrote many postings about VSAN. Here a complete overview. A selection of those blog posts which are interesing for this case. Duncan Epping How long will VSAN rebuilding take with large drives? Duncan Epping Disk Controller features and Queue Depth? Cormac Hogan VSAN Part 25 – How many hosts needed to tolerate failures? ALERT: Veeam B&R customers read this before applying VMware vSphere 6.0 Update 1! !